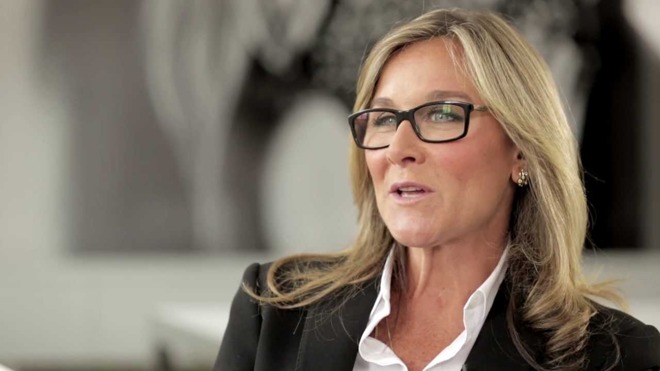 Apple's retail chief, Angela Ahrendts, is set to make an interview appearance at next month's Cannes Lions festival in France, according to organizers. The executive will be interviewed by Apple's own Tor Myhren, VP of marketing communications, the Lions website indicates. The June 20 session is expected to last 45 minutes and address topics like the vision for Apple retail, the company's "humanizing technology" buzzword, and the purpose of investing in physical stores in an online-driven world. Cannes Lions is a heavily ad- and marketing-themed event, not to be confused with the city's famous film festival. Since Ahrendts is being interviewed by Myhren, the interview is unlikely to contain many cutting questions, though the company could conceivably use it as a springboard to make a minor announcement or two. Lions will take place just a few short weeks after WWDC 2018, where the company may launch new hardware in addition to previewing new versions of iOS, macOS, watchOS, and tvOS. Apple has enjoyed a favorable relationship with Cannes. In 2014, designer Jony Ive spoke with U2 frontman Bono about (Product)RED, and in 2015 the company was lauded for its "Shot on iPhone" campaign. Ahrendts has spearheaded a variety of retail changes since taking control in 2014. These include a fashion-oriented makeover of new and existing outlets, and "Today at Apple," an expansion and rebranding of its in-store events and workshops. iPhone X vs. OnePlus 6: Which smartphone camera produces the best photos?